art in architecture – Studio Art Direct's curators and art designers share their knowledge about creating custom fine art and graphic collections for healthcare, hospitality, government and corporate projects. We create extraordinary experiences for guests, staff, patients and visitors with art that compliments the architecture and speaks to our client's mission and values. Studio Art Direct's curators and art designers share their knowledge about creating custom fine art and graphic collections for healthcare, hospitality, government and corporate projects. We create extraordinary experiences for guests, staff, patients and visitors with art that compliments the architecture and speaks to our client's mission and values. 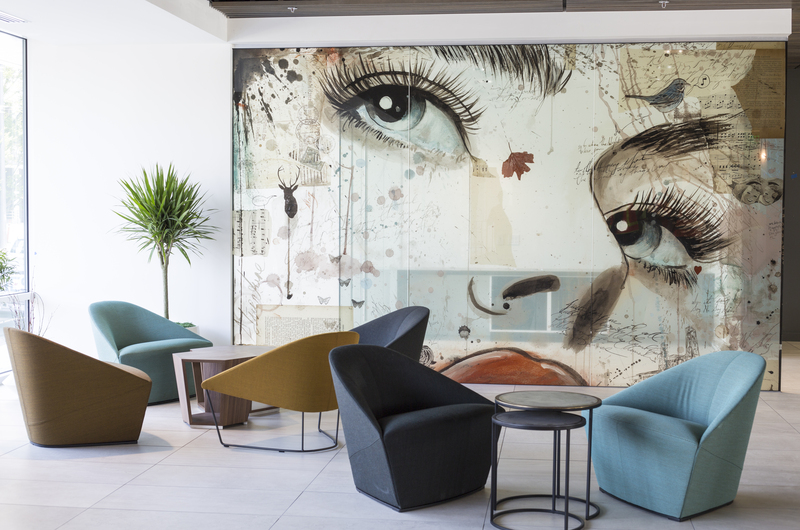 In this article, I explain the opportunities and challenges in this popular design trend – digitally printing custom art on glass to create space dividers, privacy walls, art windows, and full walls. Millennials are very disarming to people of our generation. They are running around, going to college and killing the diamond industry. They’re buying iPhones, tweeting, and only shopping at whole foods. They have weird slang and shop at weird stores, like Urban Outfitters (which is surprisingly granola for a supposedly urban store). Possibly the most 80’s interior ever: mauve, pastels, metals. The simple truth is that millennials are people, just like me and you (who would’ve guessed?). The only difference is that they grew up in a different time. And now they’re sick of it. So now they have two issues: they missed out on the past, and they’re tired of the present. So what else to do but rewind? This is the kind of thing millennials dig: a huge gallery wall, yet its neatly curated. And that’s where we are today, with millennials embracing everything the generations above them are still sick of. Hair is getting bigger, “coral” and “aged gold” are all the rage, Seinfeld is popular again, for some reason. For older generations, this is old hat. We grew up with this stuff! But for millennials its brand new. And just go talk to one, for pete’s sake! Check out our pinterest board put together by my two 19 year old interns, Ella and Harrison, Millennials Dig This for more inspiration. We have had a lot of requests to create content for TV monitors in healthcare waiting areas, patient rooms and exam rooms. So, I am really excited to share an example of what we are working on. This is a 5-minute loop demo featuring gorgeous nature scenes shot in time-lapsed, slow motion, steady-cam cinematography. The artist is an Emmy Award winning cinematographer we have partnered with. It is specifically created for hospitals, medical centers, senior care, behavioral health and other healthcare environments. Based on the philosophy of Evidenced Based Design, this stunning video is designed to calm, sooth and improve patient outcome. This content is plug-and-play ready in any format required (from the cloud, Blu-ray, m4, and the new gold standard 4K). Also available without sound. We have content available in increments of 5 minute, 14 (the average wait in a waiting room) and 1 hour (for relaxation channels). License Fee: The fee is charged on an annual basis per physical location and is dependent on the number of monitors displaying the work. Email me with an outline of your intentions including length of play and estimated number of monitors. I will get back to you with pricing. This is the first in a series of art video content Studio Art Direct will be releasing for licensed use on large AV installations in healthcare, hospitality, corporate and government interiors. We have seen a growing trend in the desire for artful content that is ready for plug-and-play. Our initial focus will be on heatlhcare, eventually we will move into art video for corporate, multi family and hospitality projects. The average stay in a waiting room is 14-minutes. In the past, TV’s were used as a distraction but studies showed that it causes stress in patients and visitors. Other applications include a looping video playing on exam room monitors as patients wait for their doctor. This is a wonderful way to soften the equipment laden rooms. For behavioral health calm rooms, a video is safe and serene. In transfusion centers, the long wait can be agitating and scary, nature art videos are an effective way to relieve stress. While the “monitor” technology exists, the content has not changed much over the years. Art consultants have realized the opportunity to showcase art, but most do it with PowerPoint style videos of images, mainly photography of flowers. This is a pitiful under utilization of the technology. So much can be done with film, video, animation, and interactive digital. The creativity just needs to be tapped. The creative genius is in the new crop of art students and emerging artists born and raised on digital media. Over the next 8 months, I will be working hard to discover talent and help new artists craft work towards creating digital content for the built environment, and especially healthcare. It is an exciting new market segment we are venturing into and we are jazzed. Video installations are becoming very popular as the price of monitors and content management go down, while the public’s thirst for digital and interactive content goes up. CLOSED – THANK YOU FOR SUBMITTING! We reviewed 1000 artworks, shortlisted 120, and finally selected 20 artists. Those artist’s works will be reproduced 101 times for the KP Interstate Campus Refresh. Studio Art Direct Inc. is looking for new works on paper depicting neighborhoods of NE Portland or artists currently residing in these neighborhoods. Selected preferences include illustration, watercolor, printmaking, mixed media, and digital art. We will be selecting 10 different artworks by artists from these neighborhoods. We seek diversity in our artwork and request that pieces are suitable for the healthcare environment (not too abstract, positive and uplifting). Think iconic NE Portland neighborhoods – artful and unusual. Eligibility: Portland Oregon artists only. Preference for artists residing in the following neighborhoods: Portsmouth, St. Johns, Kenton, Overlook, University Park, Freemont, Humboldt, Boise, King, Vernon, Sabin, Alberta Arts District. Studio Art Direct Inc. is an art consulting firm in Portland, OR. We are currently expanding our network of artists and are curating new works including illustration, watercolor, gouache, mixed media, digital, paintings, and photography. We love modern, fresh, bold, graphic, hand drawn works depicting Northwest icons, Oregon neighborhoods, PNW scenes, and flora and fauna of the Pacific Northwest. Works need to be positive, uplifting, and created in a spring color palette. Completely non-objective or controversial works are not suitable for our clientele. See Samples. Eligibility: Pacific Northwest Artists only. Paintings should be a minimum of 24” high. Here is a quick overview of our corporate art consulting process and projects. We gave Blurb a try and created both a hard cover and online book.